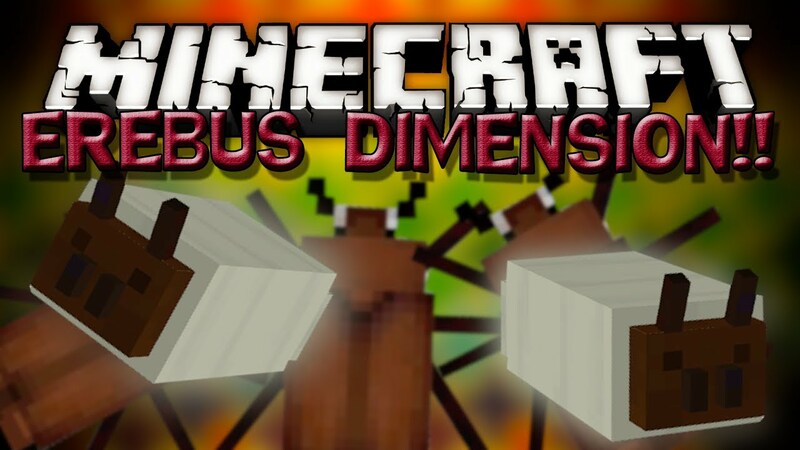 Erebus Dimension Mod 1.7.10 adds a brand new dimension filled with bugs. There are many unique weapons and armor that can be crafted. One of the most unique features are the altars. They can grant special abilities such as healing, repairing gear, and even giving experience. 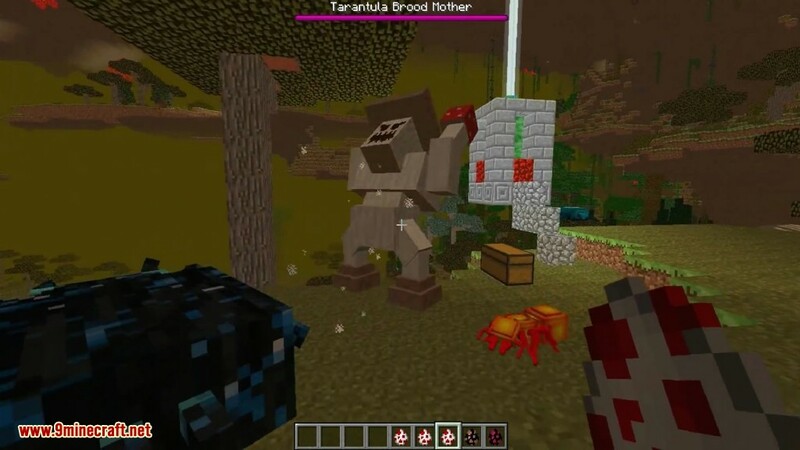 At the moment there are tons of mobs and a couple mini bosses that can be found in dungeons. 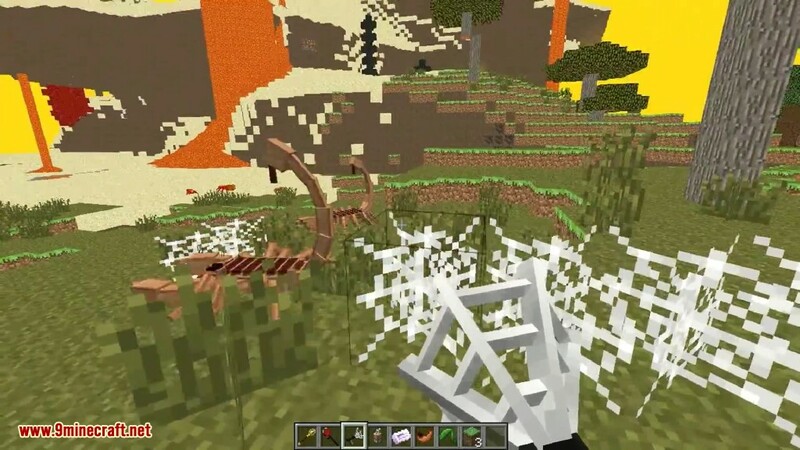 This mod focuses on adding a whole new dimension to Minecraft, with many new creatures to slay, things to create and lands to explore. Other things, such as an in-depth magic system and many dungeons are planned as well. This dimension is designed to provide full survivability, giving you the ability to start from scratch there if you so desire. This is, however, not recommended, as mobs are a lot tougher. 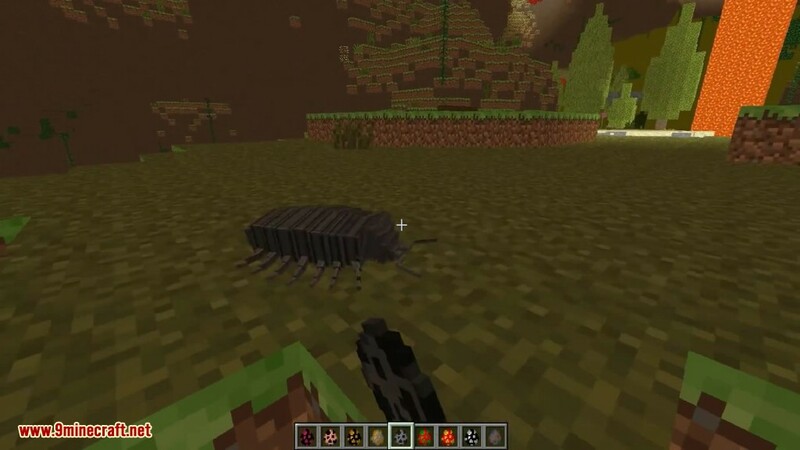 The mobs are rather diverse in their AI, and even the passive mobs are not completely harmless. 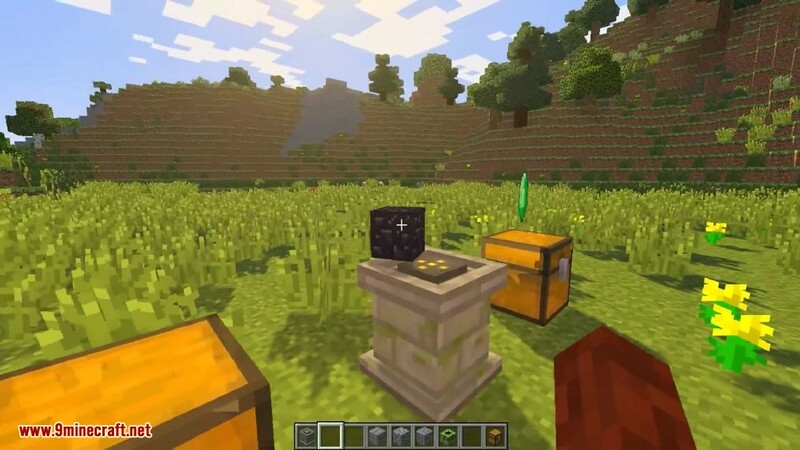 This mod plays well with almost all other mods, and is designed for compatibility with both magic and tech mods. 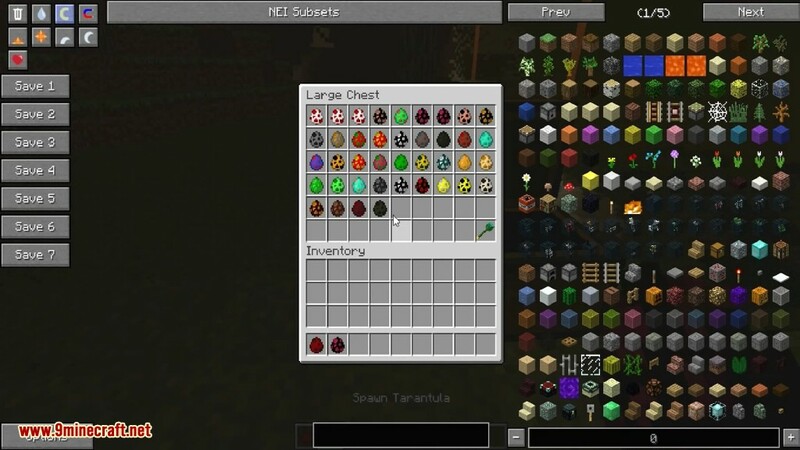 You can turn on a variety of ores commonly used in mods, such as Copper, Tin, Silver, Lead and Aluminum, so you never have to leave. 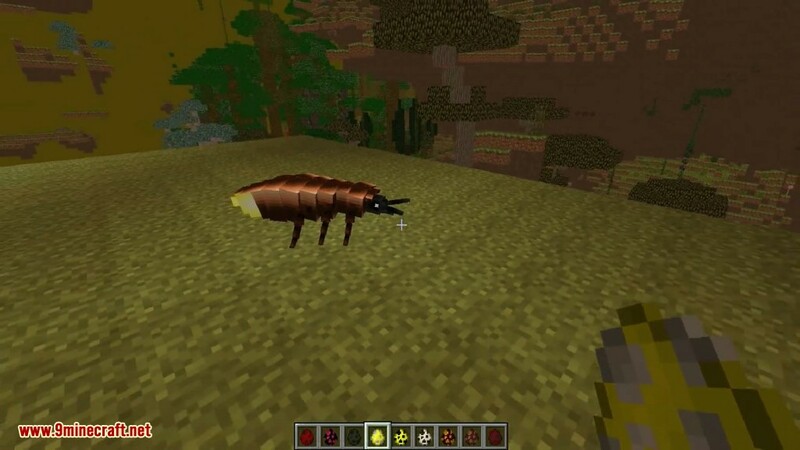 Beetle Larva: Beetle Larvae are passive mobs that spawn in the green places of The Erebus and are one of the primary sources of food for early adventurers. Beetle: There are various types of Beetles present in the Erebus, from the (comparatively) small and placid Beetle to the large and aggressive beetles found around the Erebus. 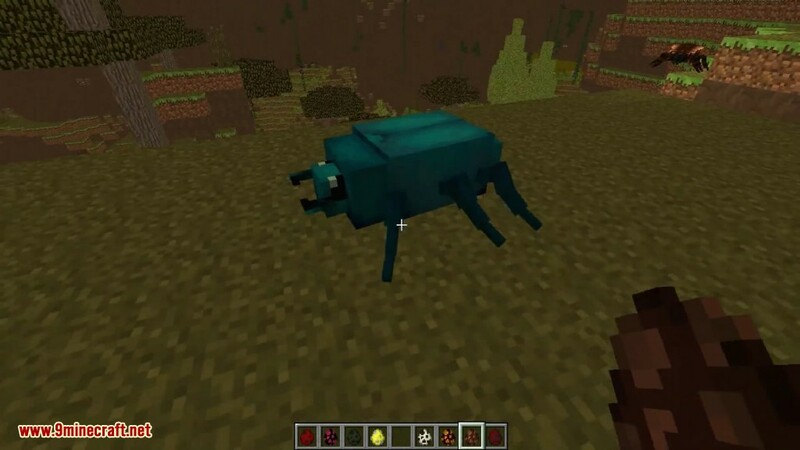 Flies: Flies are aesthetic mobs, much like Bats in vanilla Minecraft. They fly about, serving completely no purpose other than being possibly annoying and very rarely giving a Fly Wing or Compound Eyes. 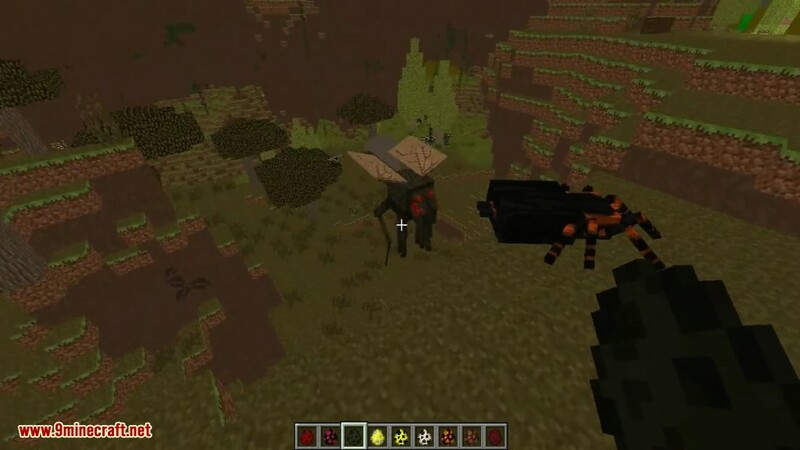 Flies can be found in all biomes. Botflies: The Botfly Larva is an invincible mob that is attached to you on occasion by a Botfly attack. These nasty little larvae cannot be removed except by death or by drinking Beetle Juice. Drinking Beetle Juice will kill the Botfly Larva and it will drop a Slimeball. 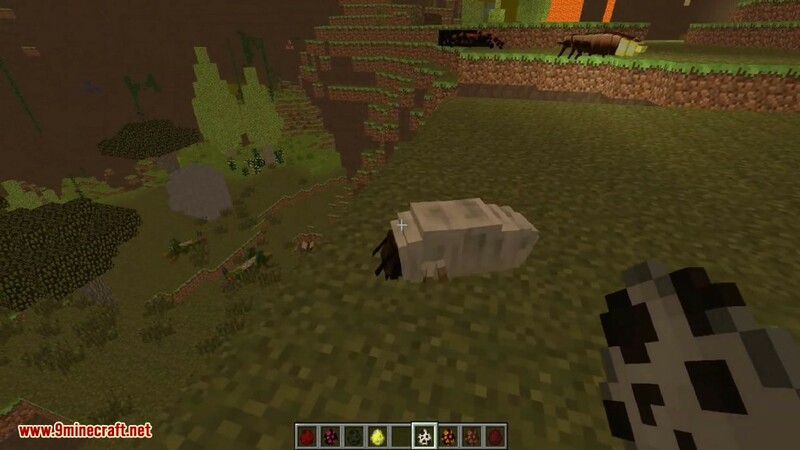 It is best to remove Botfly Larvae quickly, as a Botfly can stack up to 3 on a player, with each larva inflicting Hunger, Weakness and Mining Fatigue for 6 seconds at random intervals. Currently, there are a few annoying bugs with this creature. You are not able to use portals while it is on you, and when you die and return to the Erebus, it returns as well for some reason. Dragonflies: Dragonflies in the Erebus are distant cousins of the Fly and Botfly. 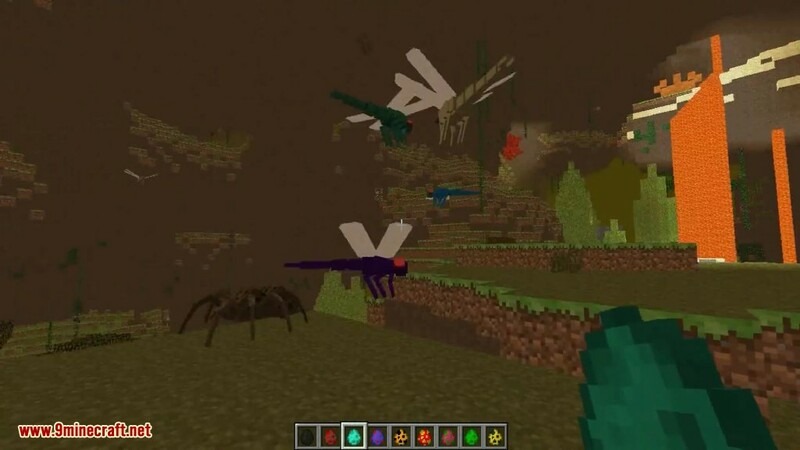 Instead of the traditional means of attack for most mobs, Dragonflies pick up and carry the player around, inflicting half a heart of damage per second. After a short time, they let go, resulting in players without suitable fall damage protection dying more often than not. 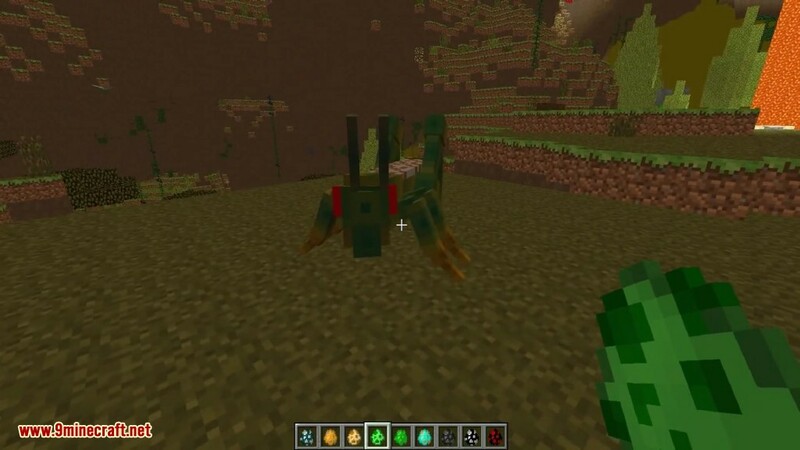 They can be found spawning from Dragonfly Lilypads. 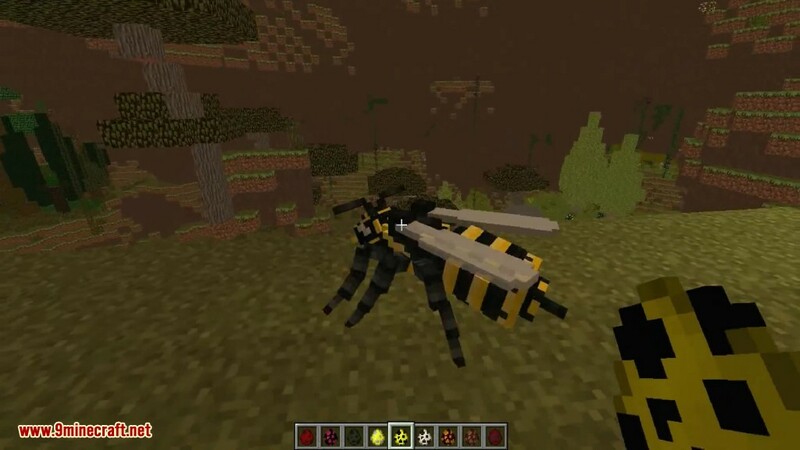 Wasp: Wasps are one of the most persistent, dangerous, and irritating mobs in the Erebus. 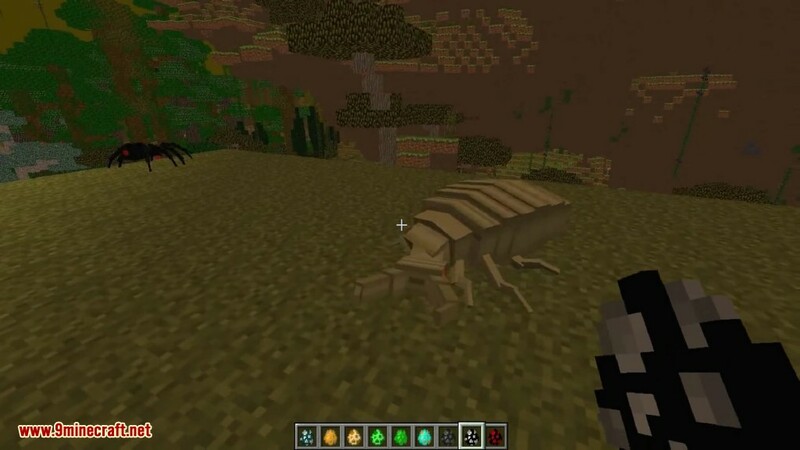 They spawn in Underground Jungles, Elysian Fields and Subterranean Savannahs, but their AI often leads them to spread into adjacent biomes, making encounters possible virtually anywhere in the Erebus. 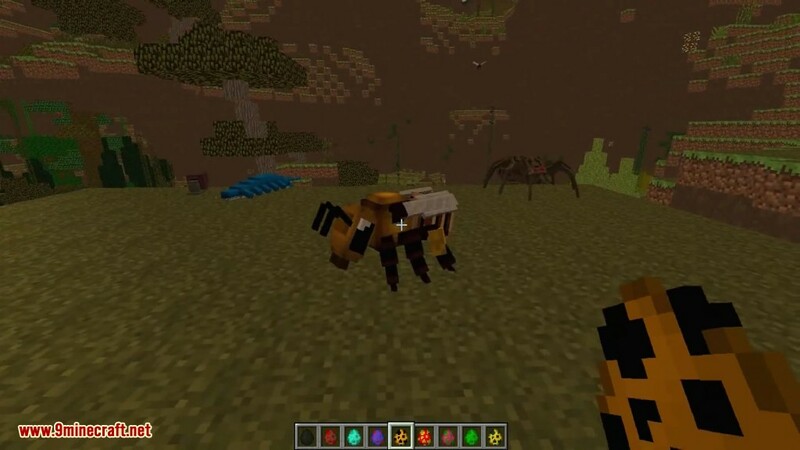 Wasp Nests, roof-mounted dungeons that spawn Wasps, can be found in Underground Jungles. 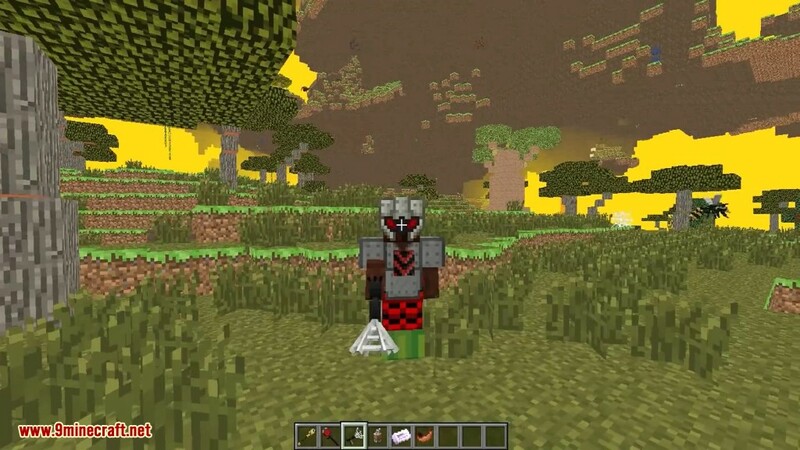 Breaking the spawner may reward you with a powerful Wasp Sword. It is recommended you avoid Wasps until you have better-than-decent gear, if you can. They deal two hearts of damage in one hit and inflict Poison for 10 seconds. Furthermore, they can fly, and are more persistent than Botflies when it comes to pursuing the player. With the addition of Solifuge Babies and the triumphant return of the Bombardier Beetle, Wasps are now bumped down to the title of 3rd most dangerous normal mob in the Erebus. 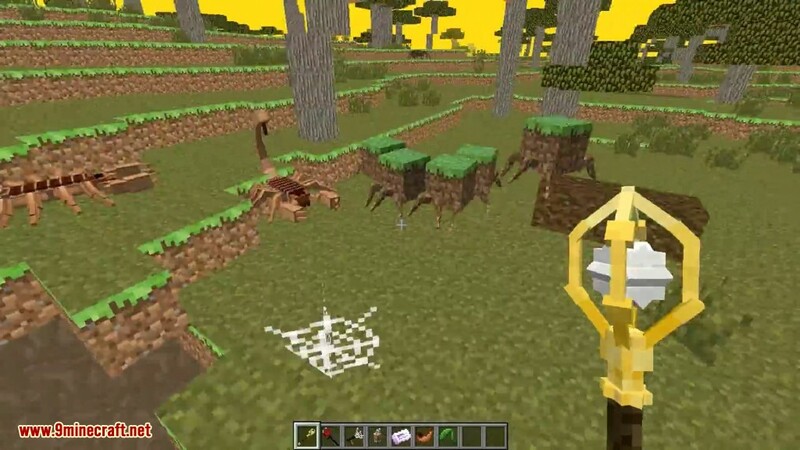 Spiders: Spiders are hostile arachnids that spawn everywhere in the Erebus, with the sole exception of Fungal Forests. 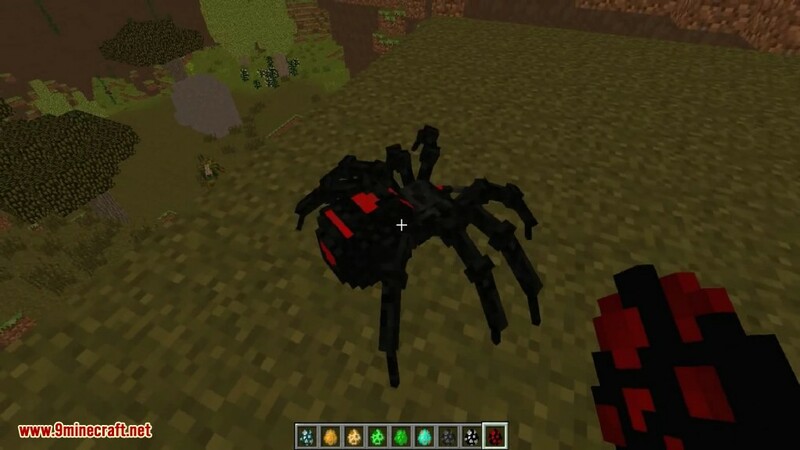 Scytodes: Scytodes are the most common Erebus spider, and can be found in Underground Jungles as well as Subterranean Savannahs and the Ulterior Outback. They might seem as weak as a regular Spider, just walking and jumping at you. However, they are able to trip you up by shooting Webs at you. 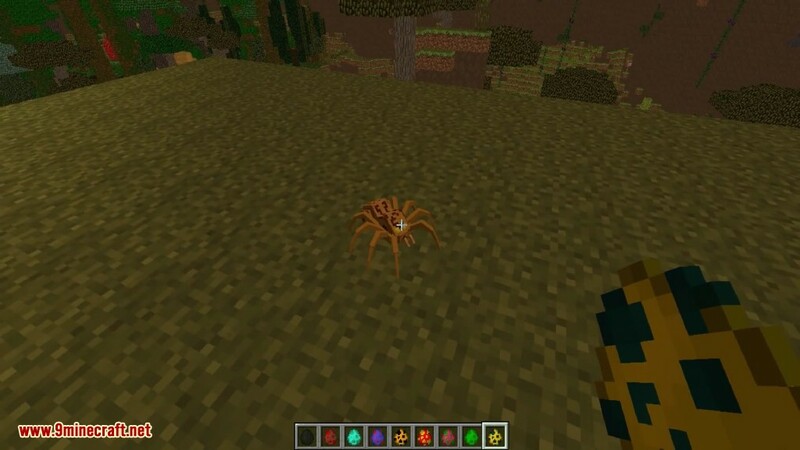 This allows them to drastically slow you down, as Webs have no effect on any kind of Spider (with the exception of Wither Webs). When killed, they drop vanilla Spider drops. They can spawn in a multitude of colours. They are the sole enemy comprising Scytode Dungeons. 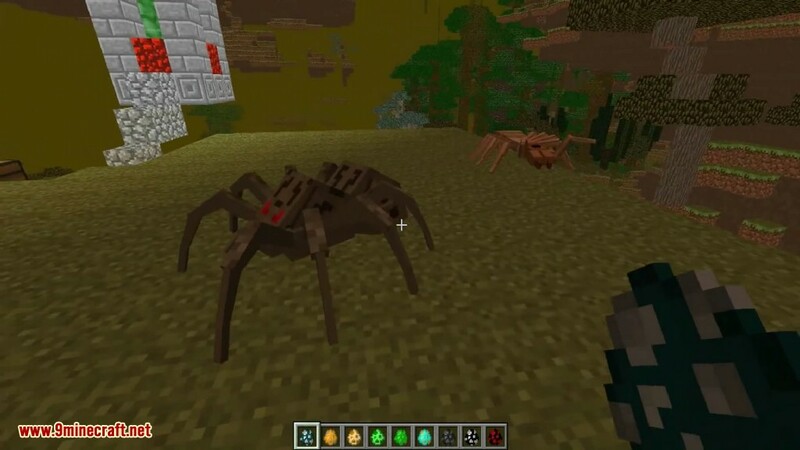 Money Spider: Money Spiders rarely spawn on a Scytode’s or Tarantula’s back, and as such are found anywhere those mobs spawn. They are very weak and are not poisonous, making them easy one-shots. They have a rare chance to drop a Gold Ingot on death. Jumping Spider: Jumping Spiders like to do one thing and one thing only; jump. They can be found in Underground Jungles, Submerged Swamps and-through Jumping Spider Stumps-Fungal Forests, leaping from seemingly hidden spots to hit you mid-jump and inflict 6 seconds of Poison. 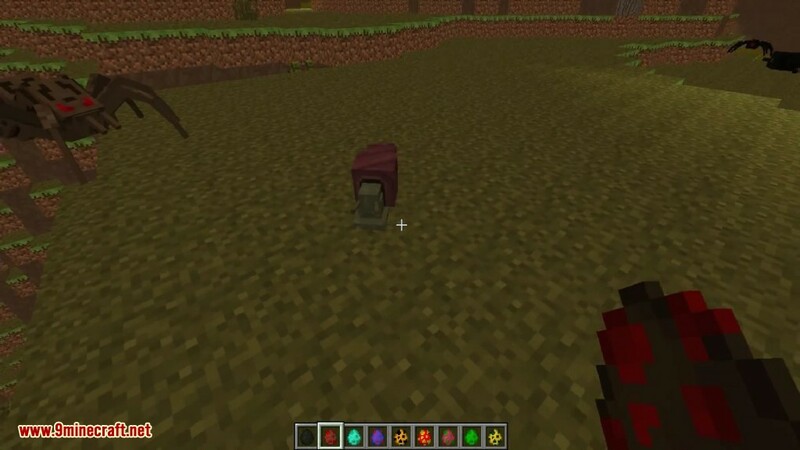 Whilst they only deal half a heart of damage, they often spawn in groups, and can easily overwhelm an unprepared or inexperienced player, since each bite re-inficts Poison for 6 seconds, essentially keeping the player perma-poisoned. The Poison effect does not stack; it is simply reset. They only drop Poison Glands. Several colours of Jumping Spider exist. Black Widow: Black Widows can spawn in three different sizes: Small, Medium and Large. 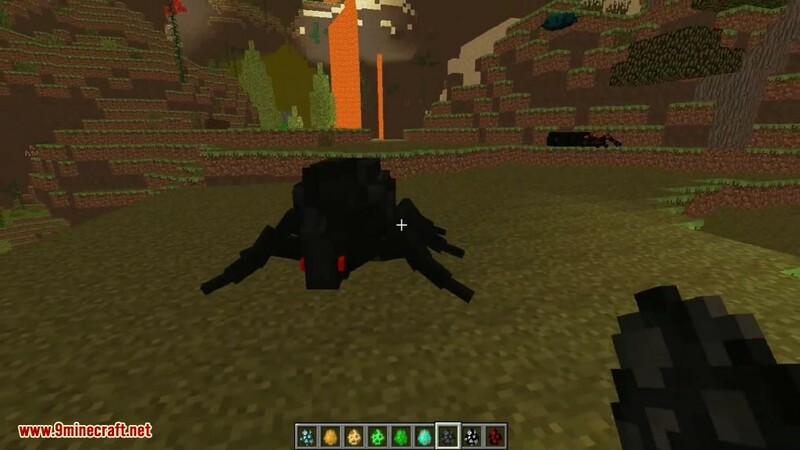 These spiders spawn in the Ulterior Outback and the Nether; making them the only Erebus mob known to spawn outside of the eponymous dimension. 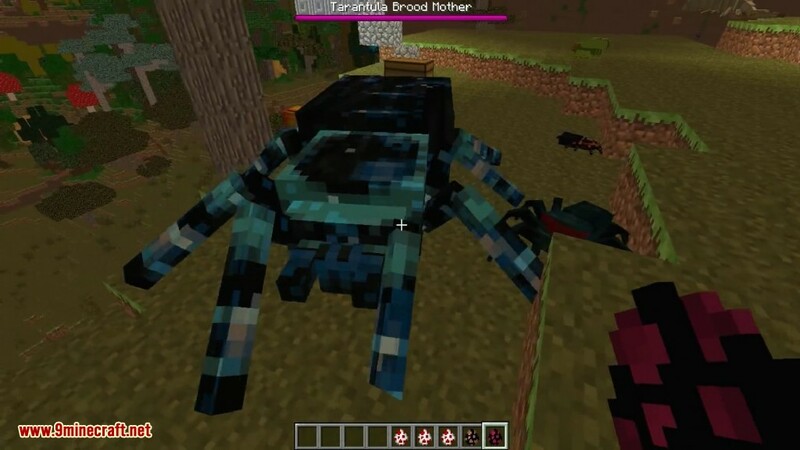 Black Widows, if not correctly avoided or slain with ranged weaponry, are extremely dangerous; not due to their outright damage (which is comparably pitiful) but due to their attacks inflicting 6 seconds of Wither upon the player. Furthermore, the true danger is their ensnaring tactics; if a player is at too great a distance for the Black Widow to melee, it will fire three-shot volleys of Wither Webs in the direction of the player. These webs act like normal Webs, with the addition of inflicting 6 seconds of Wither on contact and every second you remain in contact. This effect does not stack, but simply resets the Wither effect. Black Widows will attempt to leap at and kill Flies and Botflies if observed from a distance. They are immune to fire and lava. Tarantula: Tarantulas spawn in Underground Jungles, Subterranean Savannahs and the Ulterior Outback. They can spawn in orange or blue varieties. Quite resilient for the Spider species in the Erebus, Tarantulas have 50% more health than a Scytode (see Mob Boxes on the right) and inflict slightly more damage, but otherwise are unremarkable attackers. 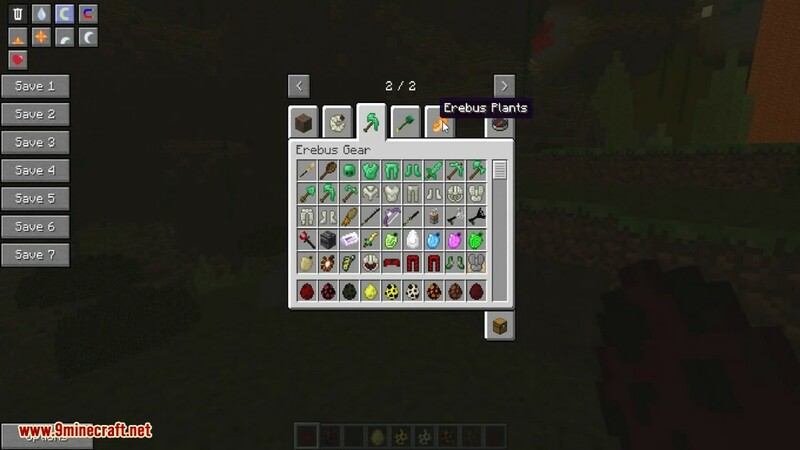 When slaughtered, they can drop Tarantula Legs, a mid-tier food in the Erebus. You’ll find these quite plentiful with a decent sword. Tarantula Baby: These smaller versions of Tarantulas are spawned by the Tarantula Brood Mother in Giant Baobab Trees, during her egg-throwing attack. They tend to die in one hit with a decent weapon (in this scenario, an unenchanted Iron Sword is not a decent weapon). Lava Web Spider: Lava Web Spiders are found solely in the lava flows of Volcanic Deserts, and as such are immune to fire and lava. Packing a sturdy 30 hearts of health, they weigh up quite well with the large Beetle species of the Erebus. However, they generally will not attack. It is unknown as to why. 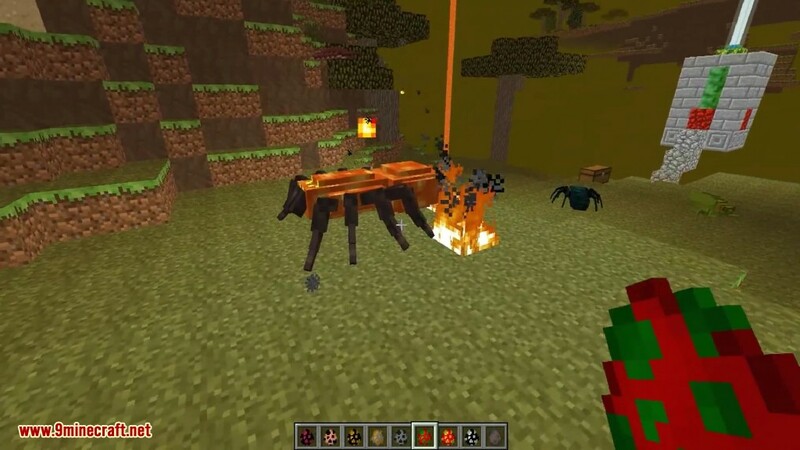 When a Lava Web Spider does attack, as they are unable to go anywhere quickly when swimming in lava, they will fire harmless versions of Fireballs at you. These Fireballs don’t hit the player, but ignite blocks where they strike. If you do manage to get within melee range of one, they will deal one heart of damage and light the player on fire. 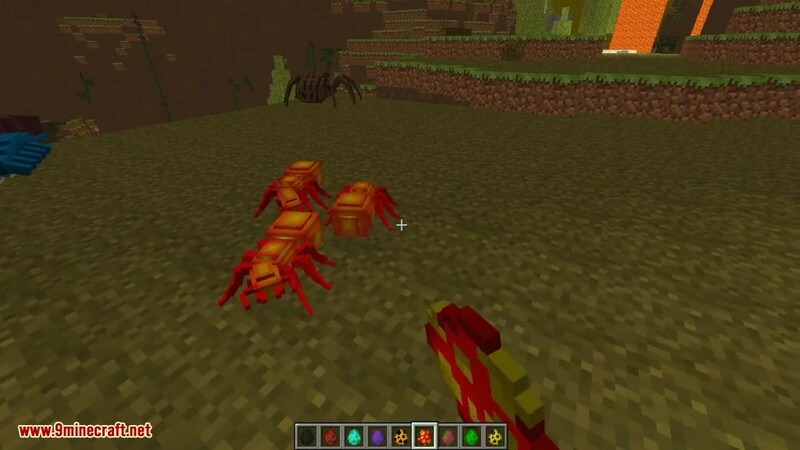 If you can coax one out of lava, it will often drop a Spider Eye and up to 2 Fire Charges. It will also create flames on the blocks it walks. Grasshopper: The Grasshopper is a magnificent mob found in Elysian Fields and Subterranean Savannahs. They (should) spawn in small groups. Grasshoppers search for food (in the form of crops and tall grass) to devour, which they do by breaking the block. During this period of eating, they breed, spawning new Grasshoppers. 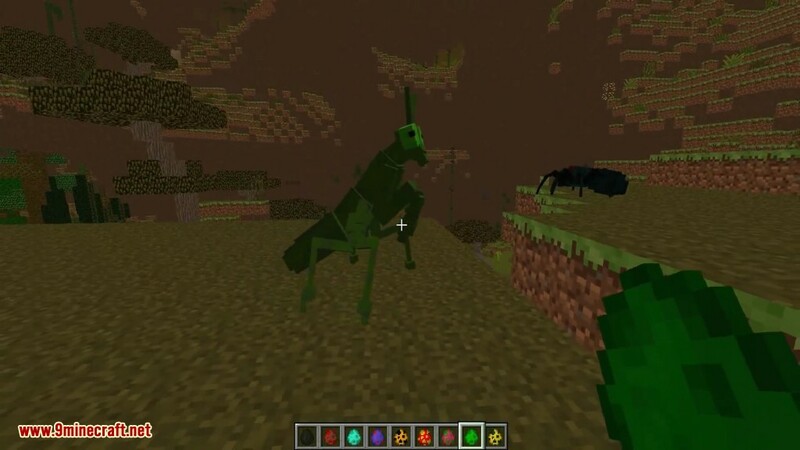 After a Grasshopper has bred a certain number of times, they will turn into a Locust miniboss. Grasshoppers are supposedly quite rare, although on several accounts they have proven plentiful. Locust: Locusts are the big daddy of Grasshoppers. Mean, green and certainly obscene, they prove to be a challenge for even experienced Erebus adventurers or those coming in from other mods’ “lategame”, with high-tier equipment. 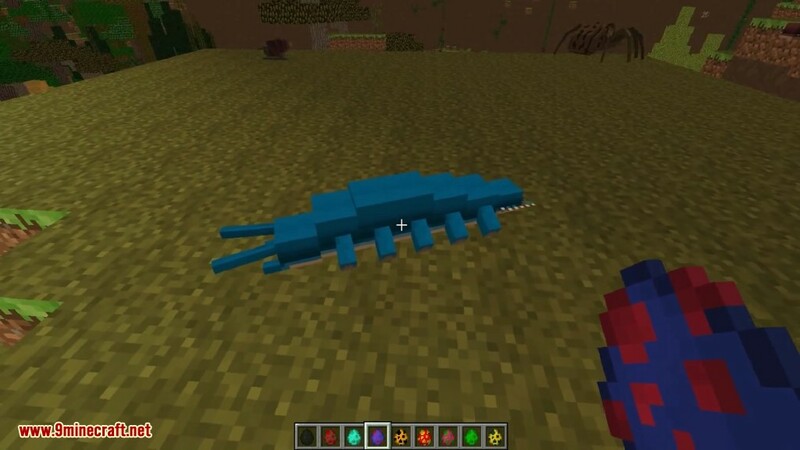 They are capable of chasing down fleeing players, depending on the terrain. Whilst they only deal two hearts of damage, they tend to attack twice per second, giving them an astounding DPS of four hearts. You have been warned. Scorpion: Scorpions are relentless, powerful mobs that spawn in Volcanic Deserts, Subterranean Savannahs and the Ulterior Outback. 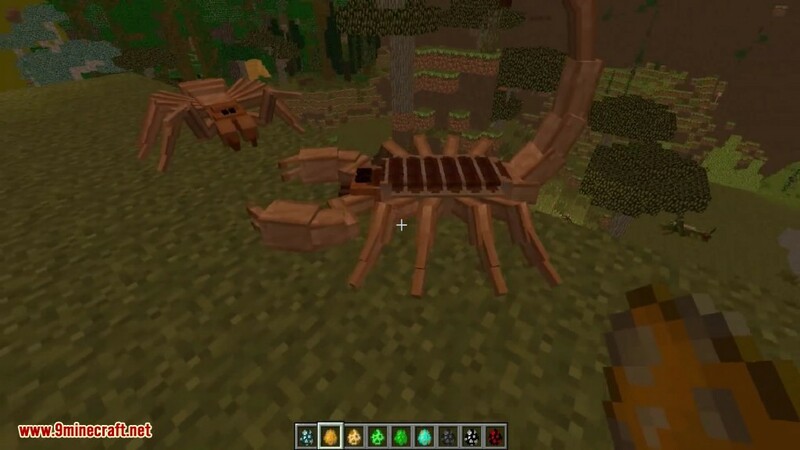 Often spawning in groups, these arachnid predators will grasp you with their pincers, dealing one and a half hearts of damage twice per second until you die or they release you. Unfortunately, in a group, they tend to grab you from each others’ claws like a gruesome form of relay race with no finish line. You can attack a Scorpion that has you in its grip. Occasionally, they will sting you, inflicting Poison for 6 seconds. Killing them drops a random number of Poison Glands, from as few as none to as many as 6. Scorpions, like many inhabitants of Volcanic Deserts and the Ulterior Outback, are immune to fire and lava. Solifuge: The Solifuge is a hostile arachnid mob. 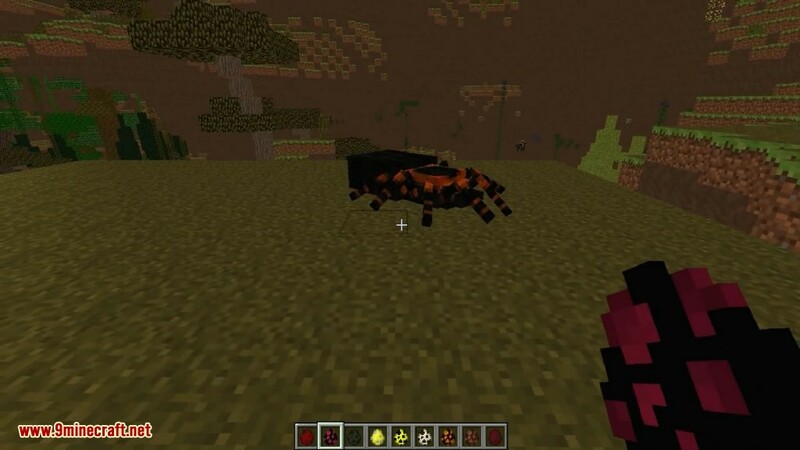 It spawns in Volcanic Deserts and the Ulterior Outback. It can can easily surprise you with its high speed. It’s quite smart at avoiding obstacles, so various traps and escape routes (such as jumping over a Ravine) won’t cut it. It’s also immune to fire and lava. Due to their death resulting in the dreaded Solifuge Babies, they are regarded as one of the most annoying/terrifying mobs in the Erebus. 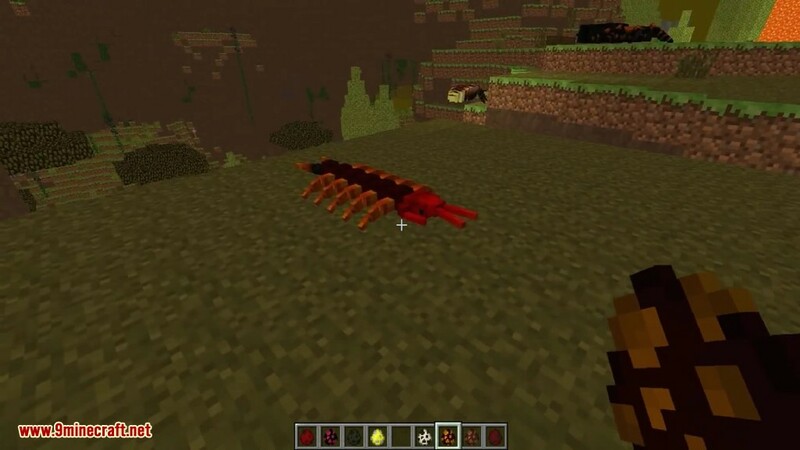 Solifuge Babies: Upon killing it, it will spawn 4 Solifuge Babies that are all named after a potion effect. They only inflict half a heart of damage, but when four of them attack you all at once and there’s one named Blindness… well. Things don’t end well.